2. Poetic gems buried among the illiterate rubbish that fills youtube comment threads. 3. 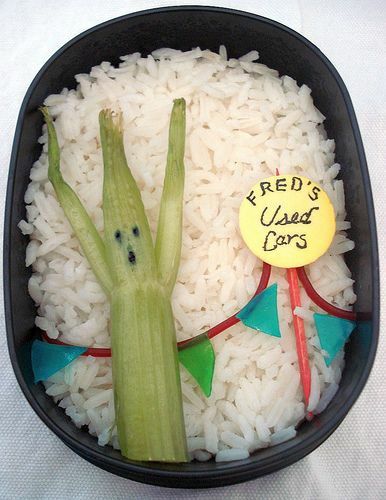 Bento-box art of a used-car lot (from this post, which contains many more conventionally cute lunch artworks). 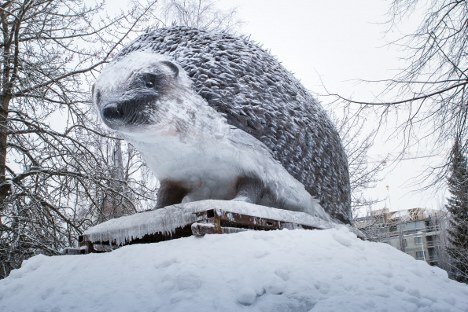 We got our first reader submission for Check This Out this week, from my brother Rob*: wonderful photos by a Russian woman of her sons with different animals. In return, here’s Baggywrinkles, a fun series of comics about life on a sail training tall ship, by Lucy Bellwood. I love unlikely animal friends, but especially these ones from The Onion. These animals who are not friends and have never met are also cute. An immigration form for entering the US from outer space. Here’s a heartwarming story about a man who’s made friends with his local Applebee’s on facebook. Shouldn’t Cerebral Sentimental Girl Power Mockumentaries Based on Children’s Books About Horses exist? Apparently it’s even too cold for the polar bear in Chicago right now. What happens when person tries deliberately to create the most unappealing–but physically attractive!–female OK Cupid profile. Also, we were at the T20 cricket game where this catch that has been making the rounds of worldwide sports sites. Understand that in cricket they have to catch the ball bare-headed, and also that the ball is covered in cactus spines and is electrified. If you enjoyed the end-of-chapter questions in The Basic Eight, here’s some more discussion-question-based fiction. You want to sing Christmas carols with Amy Poehler and Billy Eichner, right? Here’s a bikie gang I might be interested in joining. More reasons to be happy you got a mac. Correct punctuation makes you sound angry. I sent Jeremy the link to Homelamb nearly two weeks ago, but he has not yet watched it. Maybe if I embed it here, he will see it, or at least one of you fine, imaginary people might appreciate it. Or, perhaps you would care to read some restaurant reviews from Jimmy Stewart’s character at the end of It’s a Wonderful Life? Also from The Toast, What the Giving Tree Gives.